A bride’s day is the most important day of her life. She spends months, if not years, planning for her special day. The stresses of having to sit the right person at the right table and making sure there are food options for everyone is a lot of stress for anyone to handle. One might even say that wedding planning causes so much stress, it would cause you to pull out your hair! But please don’t do that! We’ve got what you need to care for your lovely locks for your wedding day and make sure you have fabulous wedding hair. All eyes are on you on your wedding day and looking you best is an absolute must. Just like planning the dress, the shoes and the jewelry before the wedding, brides-to-be need to prepare how their wedding hair will look. This doesn’t just mean choosing and trying out different styles, but going into the salon weeks if not months in advance to have your locks conditioned, trimmed and if need be, colored. 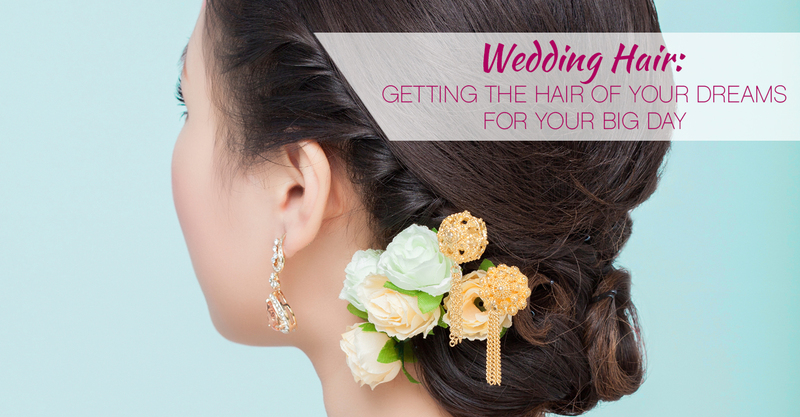 Choosing a hairstyle, accessories, and deciding who will do your up-do are just a few of the many decisions you’ll make when planning your for your wedding. To help, we’ve pulled together some of our favorite wedding hair styles, accessories, tips for working with a stylist, and what to do to prep your hair before the big day. A good cheat sheet for any bride-to be. There are also several other ways to do-it-yourself as it is very popular nowadays for many brides to forgo the hair salon and do their own hair and makeup. If that is the direction you choose to go, some of these tips still apply. You just need to remember that keeping your hair in good condition is still important. Using Hairfinity hair growth vitamins will especially help with making sure your wedding hair is at optimal health. Also, caring for your tresses by using shampoos and conditioners that will keep your hair healthy and shiny are very important if you are forgoing the hair salon. Make sure your hair is in the best condition possible before you set foot into the salon for your initial wedding hair consultation. Also, most importantly, find a stylist that you trust to achieve the look that you want or someone who could guide you in the direction of what you are thinking. Occasionally that means you might have to try a few different stylists to find the right fit but patience is a virtue and your hair will thank you for it. First off, it is important to leave enough time before your big day to consult your hairdresser to discuss things such as conditioning, color and trimming to ensure your hair is in its best condition for your wedding. Go and see your hair stylist at least 6 months before hand in case you want to grow your hair out. If you are planning on adding some highlights or a permanent color to give your wedding hair a glossy and beautiful finish, have this done two weeks before hand in case it needs more or less. Having your color done the day before could leave it not looking as good as you hoped it would be. Great bridal locks require a little love and devotion. We all know that washing, blow-drying, and heat-styling on a daily basis makes for a messy head, full of split ends and “wispies” (those little broken pieces of hair that stick up from your scalp). Start repairing from the inside out. Experts believe that a diet filled with Vitamin B helps bring out your hair’s natural shine (dull hair is actually a symptom of a Vitamin B deficiency). Foods like fish, nuts, and eggs will give you a good head start. On the outside, an invigorating scalp massage and deep conditioning treatment (about 4 weeks prior to the event) not only feels good, but stimulates the hair follicles and adds body. FYI Despite what many bottles claim, there is no way to repair damaged ends — once your hair breaks, get a trim. Also, if you can give your hair a rest from over processing, apply some color glazes, semi-permanents or vegetable colors in between permanent color treatments/highlights this will maximize the ease in styling and increase the health and shine to your hair. Adding a daily supplement into your diet that directly increases hair health and shine can also be extremely beneficial, and one you may want to continue after your wedding is over. Look for supplements with ingredients such as: MSM, Hydrolyzed Collagen, Silica and Vitamins A, C and E. These ingredients stimulate the production of healthy collagen, keratin and eliminate the free radicals that damage the reproductive collagen cells in the body. This has amazing results with not only your hair ( shinier, stronger strands and thicker volume) but with your skin and nails too. What bride to be doesn’t want her skin to glow on her wedding day? Try adding Hairfinity hair growth vitamins into your everyday supplement routine and just watch the fantastic results as they enhance your hair, skin and nails. If your hair is a little damaged from overuse of heated appliances such as straighteners and hair dryers, use a conditioning hair mask once a week. Essentious hair care system is a great option as it is sulfate free, with an aloe vera base which keep the natural oils in the hair and doesn’t strip. Apply the mask over the entire hair and leave on overnight and wash off in the morning. For a more intense treatment visit the hairdressers who usually offer a deep conditioning treatment. It’s a myth that letting your hair dry naturally is good for it, as the cuticles are up and this makes the hair dry out more easily and keeps the follicles open to the elements and pollution. Sea kelp and vitamin B is proven to be good for your hair, skin and nails. These can be found in most health stores and chemists and do help. Another option is to look at your current shampoo and conditioner and to consider switching to one that has organic emulsifiers and is sulfate free such as Hairfinity hair growth vitamins. It really is all about working with a hairdresser you can trust to get you and your hair looking its absolute best ever. Condition is the key, with the combination of a fantastic hair stylist and do it yourself methods such as adding a vitamin supplement specifically for your wedding hair, skin and nails along with adjusting your shampoo and conditioner to include more natural ingredients, there is nothing stopping the gorgeousness that will be you on your big day. Taking the time to care for your hair and planning ahead so you can have the best hair day of your life might take some time but it is so worth it. All eyes will be on you (as they should be) and you will be able to bask in all the glory and gorgeousness of your special day.